Not the best start to 2011, I really let things slip on the planning, and this meant I was playing catch up. I just about figured out that for my target of 300h for the year, I needed to do at least 5 hours this week, once I’d done a bit more work on the plan it turned out the figure was 6, too late then to make up the difference. Anyway lesson learnt. I need to plan my weeks ahead and in general this year be commuting 3 days a week if possible for everything except rest/recovery weeks. Still doing planning. So needed to get out on the bike today to hit the weeks target of 5h. Did my best to stay in Zone 1, and pretty much managed it. Felt better for it. Slow ride home, try hard to keep in Zone 1. The hills are hard, best I can do on the Zaskar with the road set up is Zone 3. 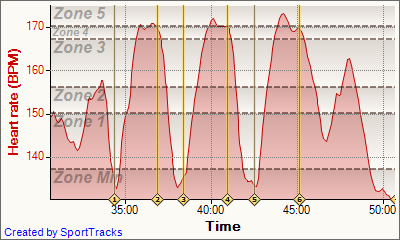 But does confirm the final hill will make a great point for doing Z3/4 intervals, might try some later in the week. Didn’t manage to keep in Zone 1 as planned, rode more on instinct than by watching the HR. Probably because weather was wet and rainy. Managed to get in 3 x 2.5 min hill climbs (Zone 4) with 1.5min rest. Felt good on all the efforts and the graph looks pretty. I had the grand parents over so needed to keep this session short and sweet. I used my now favourite road loop but added in some hill repeats on the two decent hill sections. The longer hill between Slaughterford and Thickwood makes a great interval, 6 minutes to climb in Zone 3. Unfortunately my final interval was spoilt by some horses going slow down the hill. I did feel strong at the beginning of the ride, the days recovery must help.